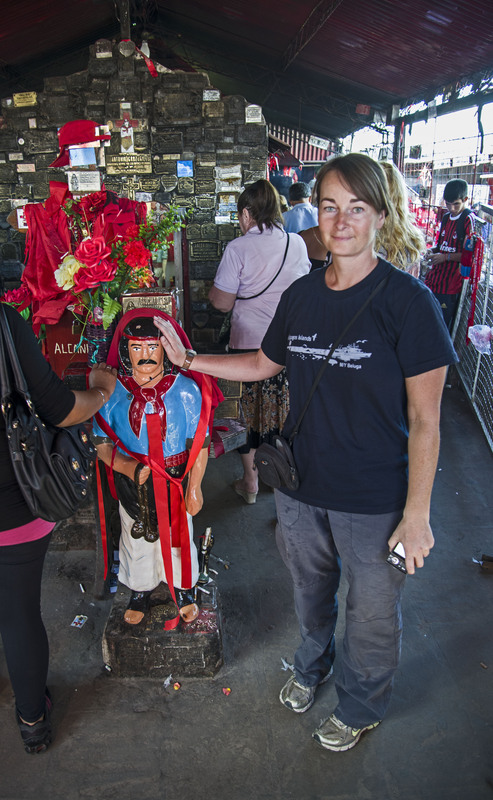 Throughout Argentina there are small shrines at the roadside decorated with red flags and often with a small colourful statue of a little gaucho man. 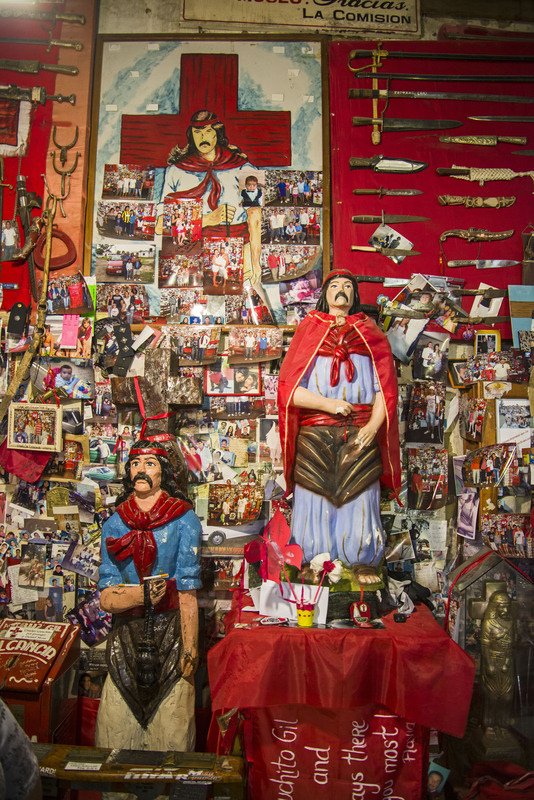 These are shrines to a Robin Hood-esque character called Antonio Gil also known as Gaucho Gil. We just happened to be passing Mercedes which is the final resting place of Gil and the site of a very large shrine to him. Antonio Gil was born in 1847 and joined the army to fight in the War of the Triple Alliance. Once the war was ended he deserted from the army and turned into a cattle-rustler who stole from the rich landowner’s and shared his ill-gotten gains with poor local villagers. The villagers in turn gave him shelter and protection. 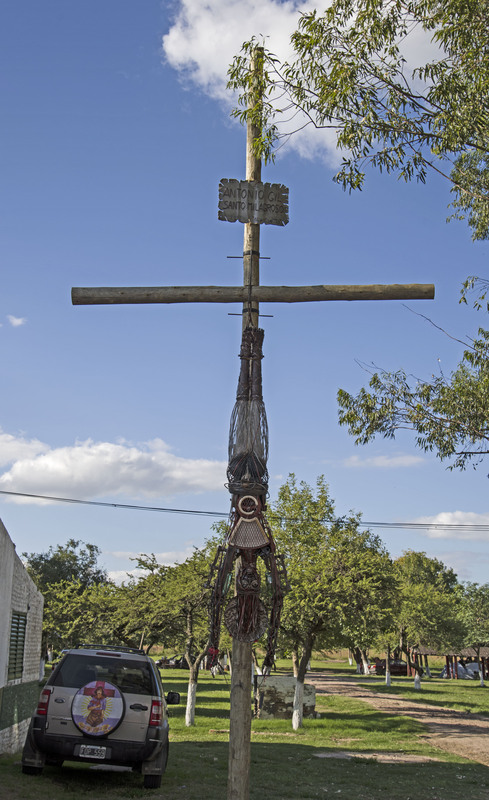 Eventually the law caught up with him and he was hung by the feet from a tree and then beheaded. However before dying he warned the sergeant in command of the police that his son was very ill and that he would only recover if the sergeant buried Gil after he was dead (it was the custom not to bury army deserters). As the story goes, when the sergeant returned home and his son was indeed ill, he quickly returned to the site of Gil’s execution and buried him. The son recovered and so was born the legend of Gaucho Gil. 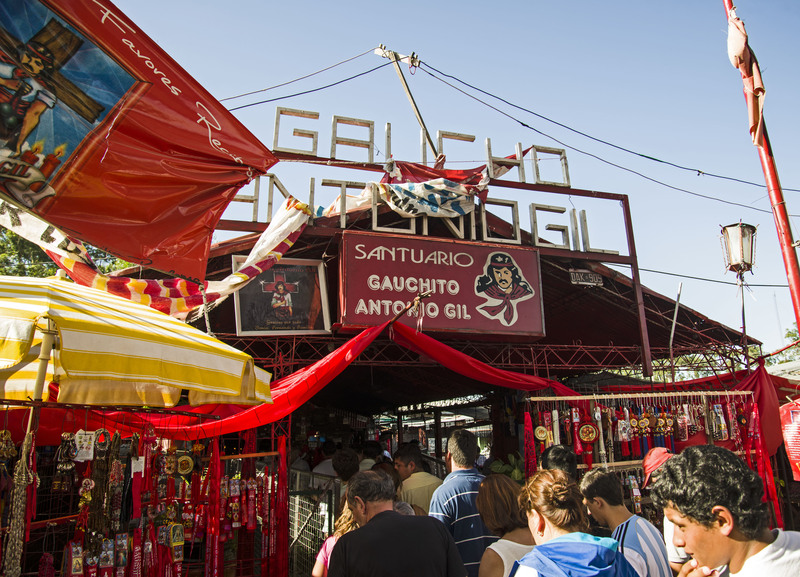 The site of the execution is now a major destination for Argentinians with a shrine surrounded by gift shops selling Gaucho Gil related memorabilia. 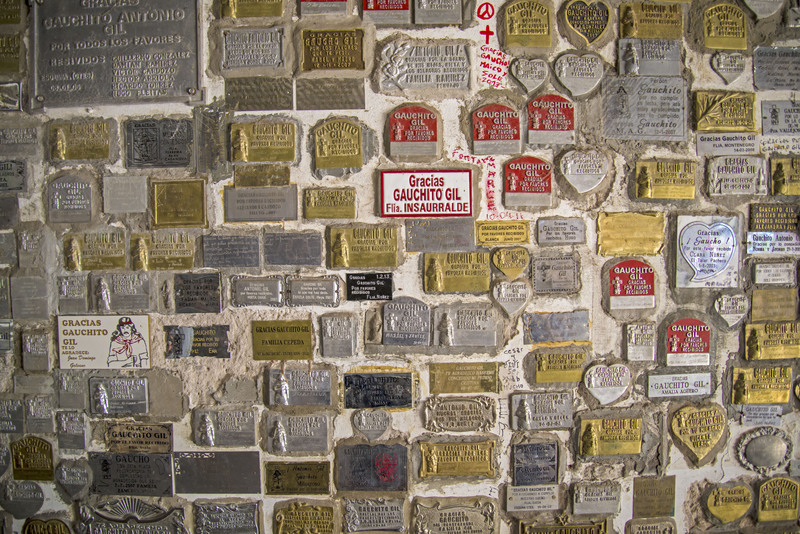 Around the shrine and in separate buildings close by, are walls of plaques thanking Gil for performing life-changing miracles for those who have petitioned him. There is even one from an Argentinian football player thanking him for making the squad. As well as plaques, there is also a room which displays the gifts that have been given to Gil as offerings over the years. There are a number of guns, knives and even swords amongst these gifts. There is even a campsite at the shrine to allow pilgrims to stay overnight. We took advantage of the campsite and visited the shrine rubbing the head of the small statue of Gil for luck. Still enjoying your blog. Really amazing! And very very helpful. Thank you very much for the excellent infos about border crossings, camp sites and all. You guys almost 2 years ahead of us. We arrived from the UK to Halifax in December and slowly made our way down to California where we currently are (and have been for a couple of months -family visits). Within a couple of weeks we’ll be heading down to continue our travels to South America. We managed to camp at excellent spots in Canada and the US -wonderful nature spots in National forests or BLM lands where camping was lawful and free and peaceful. Hardly ever parked in RV parks. But I have the feeling that in Mexico and other countries safety might be one of the top priorities and it is necessary to book into RV parks. As you guys are the travellers who have been at these countries most recently probably you have the most up to date info on these. We are really jealous of you guys being at the start of your trip. There is a really great book – Traveler’s Guide to Mexican Camping by Mike & Terri Church which is the bible on Mexican camping (and has some Belize and Guatemala sites). Needs to be used in conjunction with their website as some campsites have closed. Our approach was to always park somewhere secure in Mexico, Belize, Guatemala, Honduras, El Salvador and Nicaragua. In Costa Rica and Panama we free camped more as we felt a lot safer. However that is not to say that you can’t free camp in the other countries – it depends how you feel. you won’t find RV parks as such south of Mexico and you’ll end of staying in all sorts of places. Petrol stations are always good overnight stops if you can’t find anywhere else. We have also spent nights in secure parking lots – sometimes they can actually be quite nice. They are everywhere and can give you city centre camping. You have to be creative but we have been surprised at the places that will let you stay – from fire stations to 5 star hotels. Do some internet searching for other travellers sites. The problem of being in a truck is that most travellers are smaller and often you might find that you don’t fit !